I am figuring out what is the right way to hold a crochet hook. This is because Daddy and I have different ways to hold a crochet hook. I hold my crochet like a knife and daddy hold his hook like a pencil. Which is the right way? That's what I try to find out. 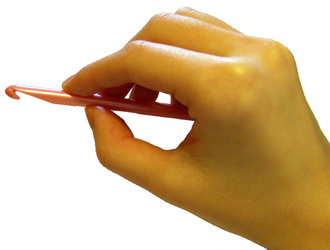 There are two basic ways to hold a crochet hook. Most of the crocheter I have seen is doing this method. As I already said, Daddy Allan holds his hook like a pencil. I tried holding my hook like a pencil but I had a hard time crocheting. The yarn keeps on slipping and I can't control the yarn. That's why I just hold my hook like a knife. For me, the knife method is easier and I can crochet faster. Downside for me is when I crochet too long, I feel a sore in the upper part of my palm. So I have to know when to stop, which is by the way hard as crocheting is so addicting. Promise, you will have hard time stopping your self until you have finished a masterpiece. 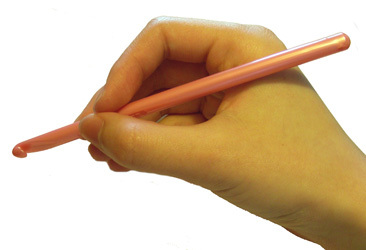 Actually, there's no right or wrong way to hold a crochet hook. Choose the method you are comfortable. So how do you hold a crochet hook? I used to know how to crochet. i wonder if it's like riding a bike, that it'll come to you again when you do it after hoiw many years. May ganung tawaga pa pala sa paghawak ng hooks. My mom use to have a set of that tool. I use to play with it when I was still a little kid. But now, I dunno where it went or goes. I'm more comfortable of holding the crochet under my hand. more relaxing and no stress on my wrist. Aha! at least I know how to hold a hook!